Bars are one of the best places to hang out with friends. 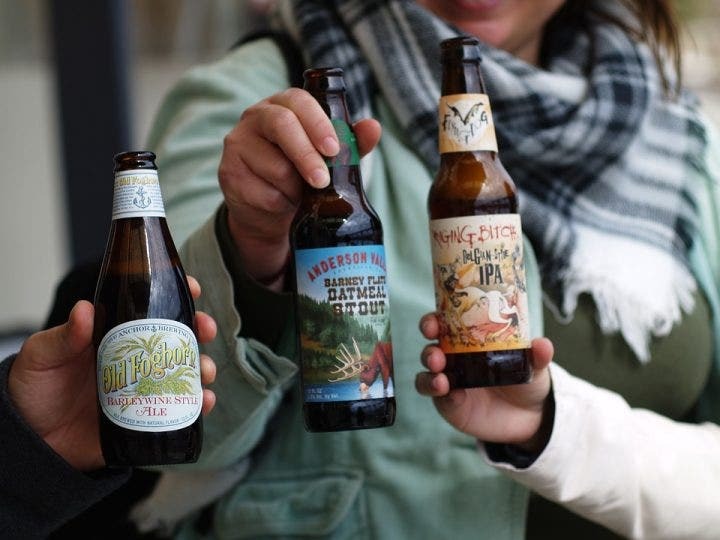 There is an unwritten rule that one must drink at least one glass of liquor or a bottle of beer when in a bar, especially if one is with a group. Bars sell drinks, so it is only common courtesy to the bar management and to your friends that you should grab one drink. Some bars are more casual than others. There are also expensive bars which require reservations and will empty your wallet once they ask you for the entrance fee. But compared to restaurants, bars sell more drinks than food so they attract bigger and louder crowds. Most bars also provide nightly entertainment by inviting singers, bands, comedians, and other performers. They also host parties and events once in a while. Are you planning to start your own bar business or just set up a mini bar during a special occasion? Then take a look at these bar menu designs. 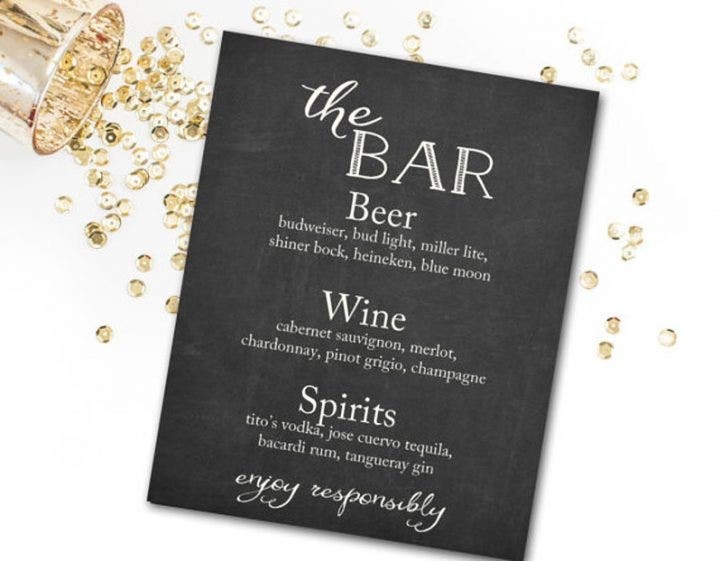 Also check these beautiful bar menu designs if you haven’t found your favorite design here. The canvas, one of the artist’s best friends together with the paint brush and paint, can be an ideal concept to include in any design. Since the canvas is blank, you can let your creativity flow and add just about anything to make a beautiful design. In this case, it can be used as a bar menu. 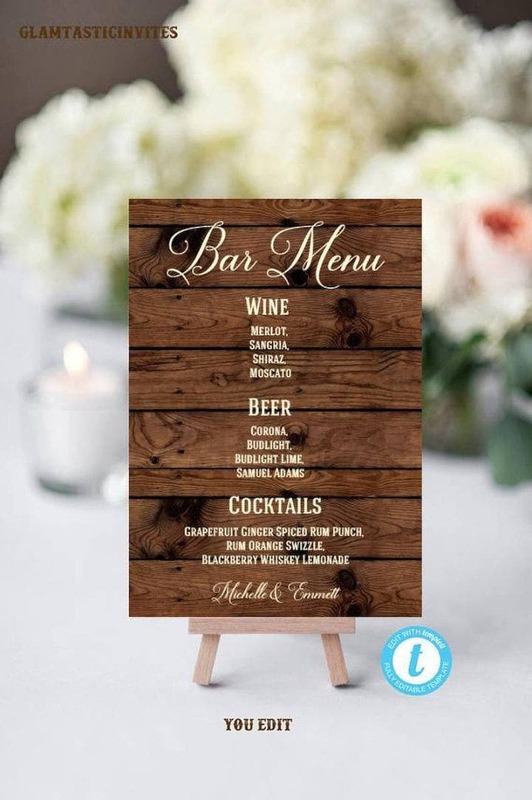 This bar menu design is a simple one, as the menu is written on the canvas with calligraphy used in the heading. The canvas also retains its white background. Tables used for drinks and all kinds of food are often made of either wood or plastic. Glass tables can break, which is why it’s not such a popular option. Wooden tables are not only sturdy, but visually appealing as well. They can be used in a posh restaurant or a messy household. Since they are a sight to behold, wooden table concepts have been used in different designs. In this bar menu, an outdoor wooden table is used as a backdrop for the menu. The items are listed in white text to contrast against the brown background, resembling a rustic design. Gold and navy blue have always been one of the most popular color combinations. Blue’s darkness and calm complements gold’s glam and glitter. Gold can also be a good partner to other dark colors such as black and red. The blue and gold combo represents celebration and is a good fit for a bar menu. Since bars are often a venue to celebrate different occasions, the bar menu should also match the joyous event. This menu design uses gold text and a blue backdrop. Calligraphy was also used for the heading. If you watched the 2013 Baz Luhrmann film “The Great Gatsby” based on Scott Fitzgerald’s novel of the same name starring Leonardo DiCaprio, you may have noticed its production design as well as its official movie poster. The movie itself including the poster design’s golden borders filled with streamlined and geometric shapes were all inspired by the Art Deco Period of the 1920s. Originating from a 1925 art festival in France, Art Deco spread across Europe and the USA and was integrated in architecture and literature. The Empire State Building, for example, was inspired by Art Deco architecture. 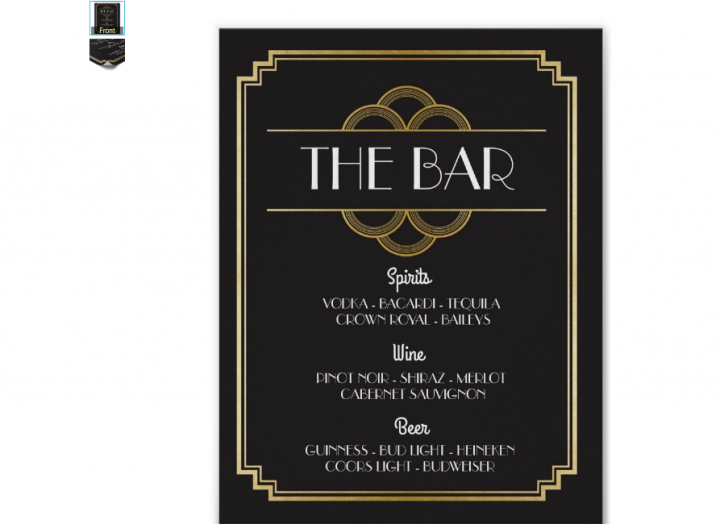 This bar menu design is a perfect example of an Art Deco design. The heading, which resembles “The Great Gatsby” logo surrounded by golden circles and symmetrical borders, looks stylish and beautiful. This design is very formal and is suited for a high-end bar. But this design isn’t exclusive for expensive bars, though. They can also be used for bars serving moderately priced wine and other drinks with dress code policies. The popularity of the chalkboard design is unmatched. It was only introduced a few years ago but it has been widely used in creating invitations, posters, tarpaulins, and other print media materials. Birthday parties, weddings, and seminars, to name a few, have seen chalkboard designs in their respective events. 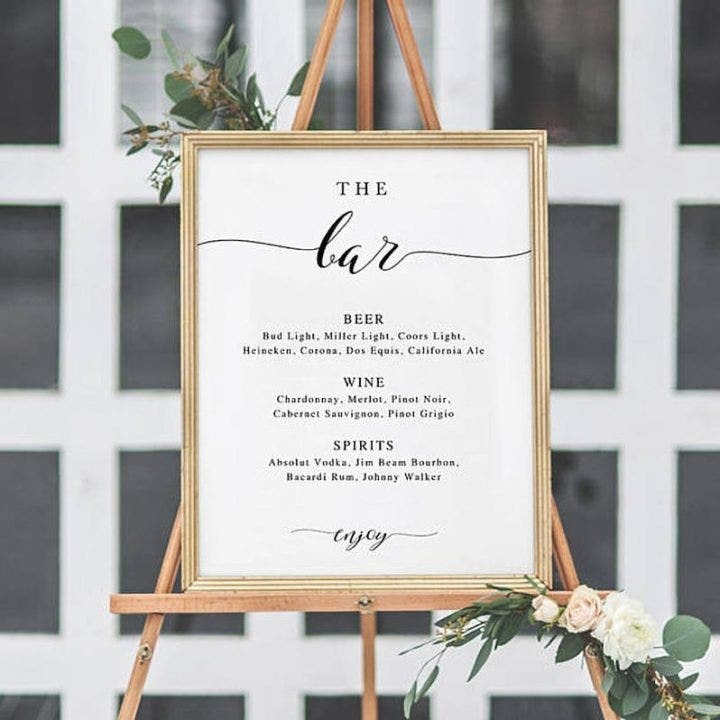 Depending on the formality of the event, the chalkboard designs can be adjusted and edited to create a perfect fit. These three black chalkboard designs have simplistic yet straightforward designs. Light chalk erasures fill the background and provide an additional layer to the design. Additionally, any font can be used in these designs. In some occasions, highly stylish fonts and images are attached to chalkboard designs. Unfortunately, they don’t match since chalkboards resemble a rough and wooden surface like a real life chalkboard. Designs need to be limited when using a chalkboard backdrop. Too many layers will prevent the natural presence of the chalkboard from flourishing. Bars aren’t only individual establishments but can also be found within other establishments such as hotels. Mini bars can also be set up during events like weddings and birthday parties. 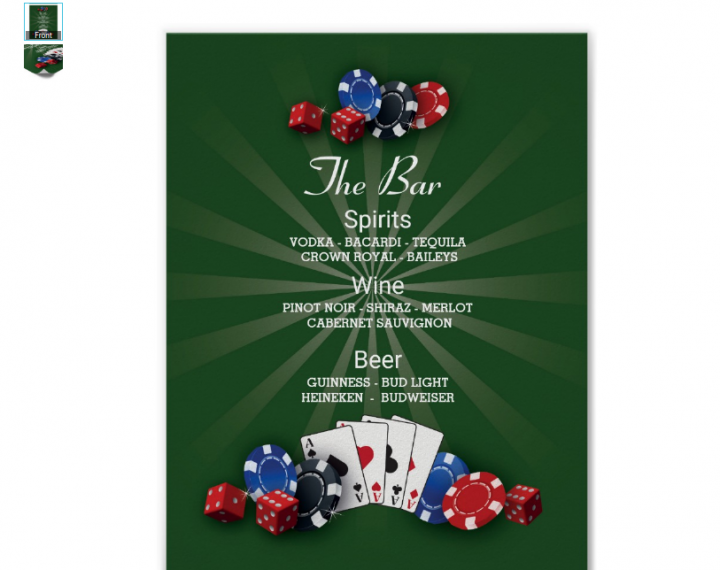 This casino bar menu design showcases the most popular casino materials like cards, poker chips, and dice. As you can see in every casino, most players have a drink in hand or have a drink positioned next to them when they’re playing. Players drink when they’re uneasy and players drink when they’re relaxed. A drink is the perfect partner for every casino player, so there needs to be a bar in clear sight so every player can just grab a drink on the go and continue gambling. 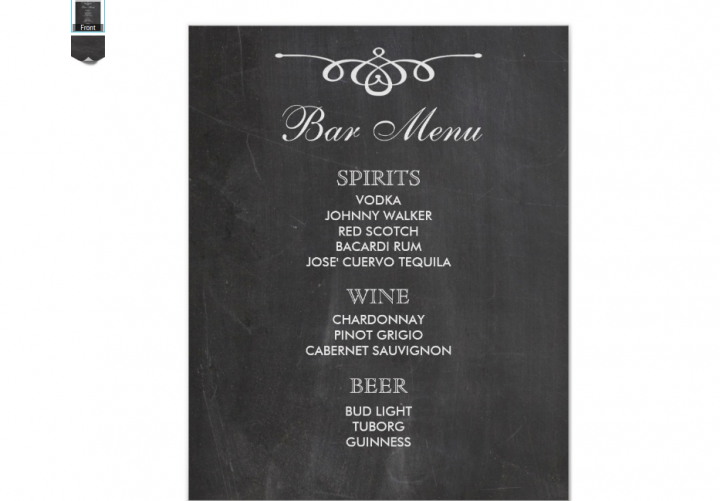 This bar menu design can also be used for family gatherings and social events where card games and poker will be played. 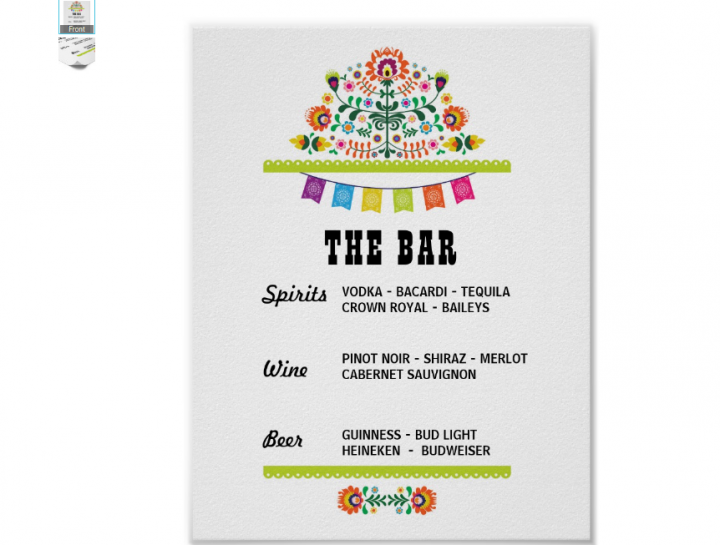 This fiesta-themed bar menu design with colorful flowers are best used for celebratory events. Resembling a South American fiesta where flowers and buntings are the main decorations, these same flowers and buntings are utilized in this menu design. Small designs are connected together, forming a large flower which is located at the top of the design. Since this resembles a South American concept, why not add some tequila or cocktail with a South American twist in your drink catalog? Combine a few colors. Unlike menu designs for restaurants, designs for bar menus can be very casual, depending on the bar’s concept. Most of the time, customers won’t compliment your beautifully designed menu since they will be more focused on drinking and talking. But that doesn’t mean you shouldn’t put any effort into making those menus. Add a little bit of art by using some color combinations in the text and background. Red and black or blue and white are some combinations you can use in menu designs. Additionally, the gold and navy menu design seen earlier is also a great option. Use dark colors for the text. Black is the most common color to use, but other dark colors such as red, violet, blue, or maroon are also acceptable as long as they match the color of the menu background. In contrast, a dark background with white text is acceptable as long as the items and its prices can be clearly read. Making the text readable is still the most important aspect of making a menu. You certainly don’t want to cause payment issues with guests because they read the wrong price when they initially placed the orders. Remove drinks which are unsaleable or unavailable. 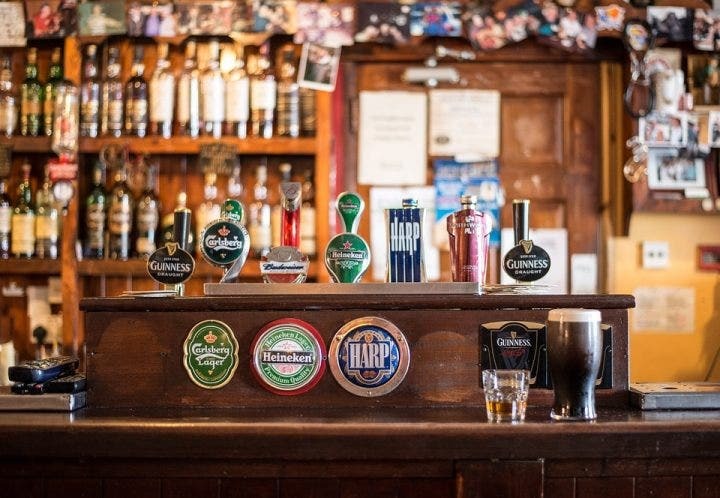 This is a common mistake among bars as they include items which they are no longer selling or haven’t been in their inventory for a long time. 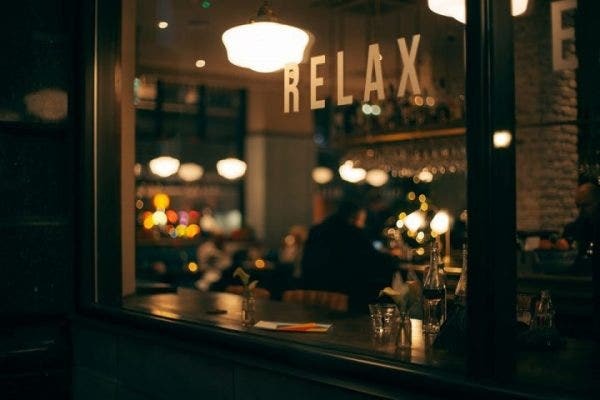 In any restaurant or bar, it’s always a frustrating experience for the customer not to get his preferred order and to have to settle for something else on the menu. Management should remove the unavailable item altogether from the menu. A piece of white tape can be placed over the unavailable item or another menu copy can be printed instead. Highlight the bestsellers. In contrast to omitting the least-sold items, highlight the bestselling ones. Similar to restaurants, the bestselling drinks should be the top priority in the menu as they are a good marketing tool for the bar. 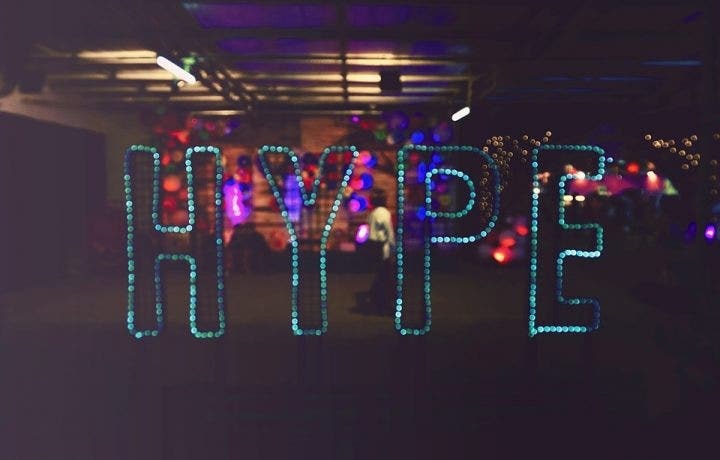 Bestsellers are the most ordered items, so take advantage of this information to keep loyal customers happy while also attracting new customers. A photo of the drink marked with a “Best Seller” tag or a photo of the drink edited inside an explosion or sphere style art are some ideas to use.